I love agencyspy. We all do, let’s face it. it’s like a daily volcanic eruption of advertising agency frustration. The real juice is in the comments. I came across this hilarious comment today. You can read the thread here. 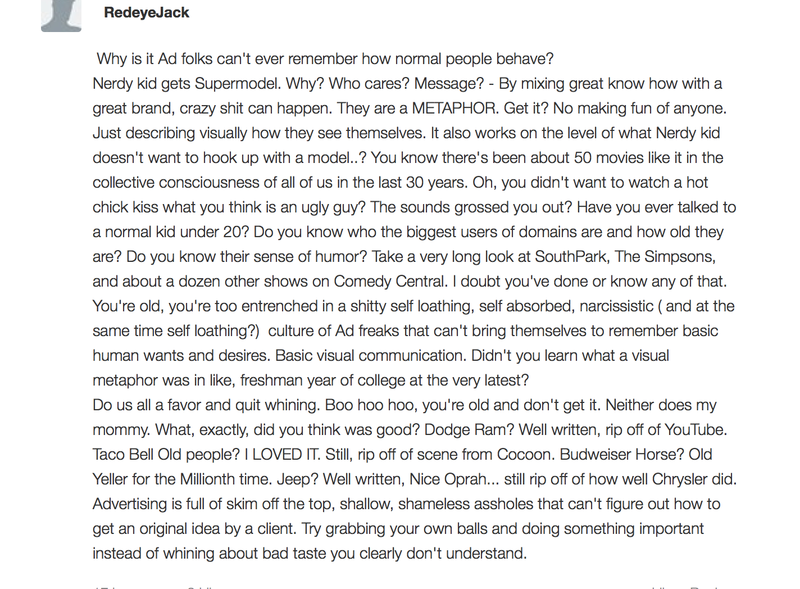 I won’t bore you with the backstory but basically someone named RedEyeJack is just pissed off at people who found the GoDaddy spot objectionable for some reason or other. And I found myself agreeing vehemently with him and laughing at the comedic head of steam he gathered as he went. RedEyeJack, I’d like to invite you to come to the Escape Pod for a drink. You sound like fun. I thought this was a brave change of tone (ie, not comedy) that made sense for the brand, the viewing environment, and let’s face it, the semi-drunk audience. Apparently the VO was done years ago by ABC radio broadcaster Paul Harvey. Nice adaptation by Texas agency The Richards Group. This time a radio station in LA asked our opinion of last night’s super bowl ads. So opine we did! You can listen below. Great game. And some good ads. And one or two really good ads. It always pains me when people complain about the standard of the ads. yes, some years are better than others, but generally speaking there are only a few good ads per Super Bowl. it’s like SNL. mostly awful. Other Escape Podders will add their top fives later. 100 MILLION PEOPLE PAYING CLOSE ATTENTION TO EVERYTHING YOU SAY. WHAT DO YOU THINK THAT IS WORTH? It has become fashionable in some quarters ( I mean you digital hater who has no experience creating TV commercials) to diss, poo-poo and generally malign TV as an advertising medium. But the inconvenient truth is that doomsday predictions about the end of TV advertising are resoundingly not coming to pass. For much the same reasons that TV did not kill radio I’m guessing. Yes, radio lost its pre-eminent place as a decisive cultural force but that didn’t mean that it just faded away either. It adapted to the changing times and found a new place in the culture. TV is in the throes of of a similar transitionary period. In some ways TV has actually gotten a lot better recently. TV dramas have gotten exponentially better IMHO. And the erosion of the primetime audience has led to the rise of “addictive TV” – American Idol, dancing with the stars etc. Clearly TV is not giving up without a fight. Sunday’s Super Bowl will serve as a potent reminder of the power of TV to unite the culture in a way that the Internet never will. And that really is its point of difference from an advertising perspective. I remember having a very spirited discussion about this very topic a few years ago with….NAME DROP ALERT!…..Sir John Hegarty. And he was right and I was wrong. I was in the TV hater camp at that point. Never fight with a knight! I have been fortunate enough to experience the power of the Super Bowl first hand quite a few times. And it’s amazing the impact it allows you to have on the culture. How much does a Super Bowl ad cost these days? $100,000 a second? Worth every cent in my estimation. And I would be so bold as to posit that anyone who disagrees simply doesn’t know what they are talking about. They don’t know the value of attention.